IPL has always been a golden opportunity for the young lad, many young player debuts from IPL got selected to ODI. It is all about these youngsters, once they enter the league they get chance to become superheroes overnight. What KXIP Captain Has to Say? KR Rahul, Manish Pandey was among the youngster performed well in IPL and made into the international cricket. But this time in the history of Indian Premier League there is no one younger them Mujeeb Zadran to play in the glamorous league. 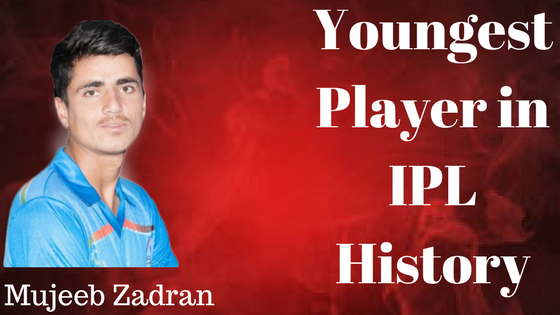 A 16 years old “Mujeeb Ur Rahman” also know as “Mujeeb Zadran” from Afghanistan is the youngest player to play in the history of IPL. An Off- Break bowler is picked up by the King’s XI Punjab. This franchise has well focused on giving chance to the young boys. The new boy is ready to set a record on IPL 2018. He took 20 wickets in five matches of 2017 ACC Under-19 Asia Cup, which helped Afghanistan to win the title. After performing splendidly in under 19, he made a debut in Afghanistan ODI last year against Ireland. He got the spark after getting “Man of the Match” on his debut match, took 4 wickets and scored runs24 run and led Afghanistan to win by 138 runs. Again in December 2017, he join the Afghanistan squad for Under-19 World Cup 2018. He was again awarded by the Man of the match for taking maidan ODI 5 wickets haul and became the youngest player to take 5 wickets haul. He is a Off- break bowler who can even bowl traditional spin and mix it up with leg spin and does googlies too. Looking at his consistency and excellent performance the Punjab franchise has given an opportunity to this young hurricane. The Franchise picked him for Rs 4 crore in the IPL auction. This young lad will be the game changer for Kings XI and might disturb the strategies of the top level batsman. As Ashwin has joined the King’s X squads as a captain and being the premier spinner of India, Zadran will get the opportunity to learn many things from the experienced Indian Premier League player. On special demand of captain Ashwin and the team, Zadran got picked up in the auction by the King’s XI. Ashwin believes he has the X factor. Zadran’s uncle Noor Ali Zadran is also a Afghanistan cricketer. Who might have given him some tips to make his IPL memorable. IPL is just about to start from 7th of april and we are excited to see the young boy bowling for the first time in IPL 2018.